- Publisher With the Big Picture Bible Time Line, you can bring the Bible to life for students of any age. Simple and bold, the visuals in this book are a perfect starting place for your Bible lessons, helping your students focus on the portions of Scripture you're teaching.^^And when you put all the pieces of this Bible time line together, you'll help your students get the big picture of the Bible. They'll see when Bible events happened in relation to each other and how those events all fit together to tell one story. Reproducible. Simple and bold, the visuals in this book are a perfect starting place for your Bible lessons, helping children focus on the portions of Scripture you're teaching. And when you put all the pieces of this Bible time line together, you'll help them get the big picture of the Bible. Children will see when Bible events happened in relation to each other and how those events all fit together to tell one story. 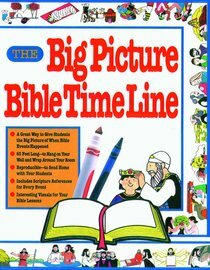 About "The Big Picture Bible Time Line"
With the Big Picture Bible Time Line, you can bring the Bible to life for students of any age. Simple and bold, the visuals in this book are a perfect starting place for your Bible lessons, helping your students focus on the portions of Scripture you're teaching.^^And when you put all the pieces of this Bible time line together, you'll help your students get the big picture of the Bible. They'll see when Bible events happened in relation to each other and how those events all fit together to tell one story. Reproducible.